This is not what road cars normally look like. That’s the first thought that goes through your mind when the new Ford GT rolls across the stage, as it did Monday for the first time in public at Joe Louis Arena during Ford’s NAIAS media event. Road cars, even in the supercar segment, look sensible and realistic and designed to meet myriad government regulations. The new Ford GT looks none of that. It’s a powerhouse of aerodynamics and technology that might be most appropriately referred to as some type of artifact from the future. The last time Ford brought back their mid engine supercar in 2004, it was a beautiful homage to a timeless classic. It unapologetically paid tribute to it’s predecessors and possessed a shape that looked as comfortable winding through a mountain road as it did sprinting around a race track. This new GT is something else entirely. It clearly possesses the family DNA but there is absolutely, positively nothing else like it on the road today. The new GT is legitimately wide, but visually it looks like it will barely fit on a public road. Compressing the greenhouse inboard magnifies the car’s massive hips and from above, it’s shape is pure figure eight. Occupants surrounded by the carbon fiber within will have precious little space between each other and a race car view over the bodywork in front of them. Much of that carbon fiber isn’t an aesthetic treatment but the carbon fiber structure of the vehicle itself. Glowing LED headlights loom over a front fascia that looks designed to positively inhale lesser performance cars. The aerodynamic elements that lead from the roof to the rear fenders are a performance consideration that really belong on a concept car. That’s just it though: this is not a concept car. 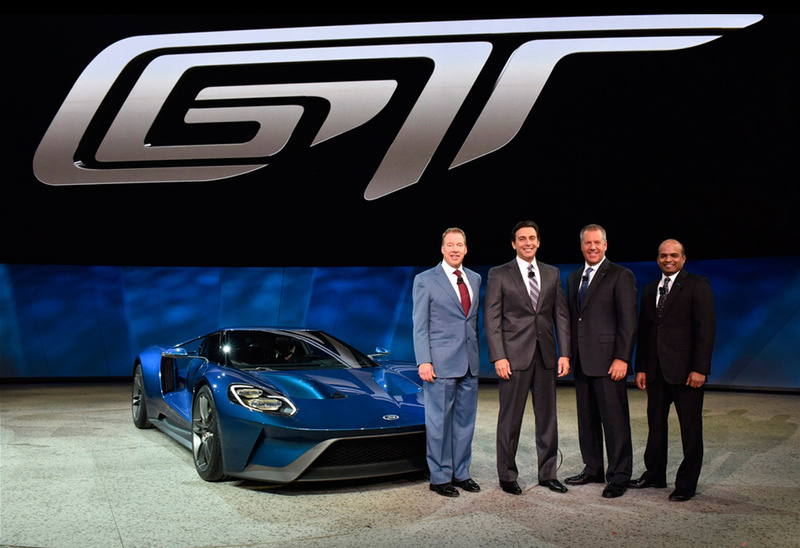 In a carefully choreographed moment of rhetorical bromance, Executive Chairman Bill Ford Jr. and CEO Mark Fields asked each other if this car should be produced, then high-fived when answering that not only would it be, but it would be on the road next year in 2016. Read it again: this is a production vehicle that will be on a road near you in 2016. For a car nobody was even sure existed one day before reveal, that’s a massive achievement. What it does once on those roads should be mind-bending. It has everything you’d expect in this type of rarified supercar air: 600+ hp, a 7-speed dual clutch transmission, massive carbon ceramic brakes. It’s targeted to beat Ferrari 458 Speciale (and to a lesser extent McLaren 650S) and you can expect it to do so handily. 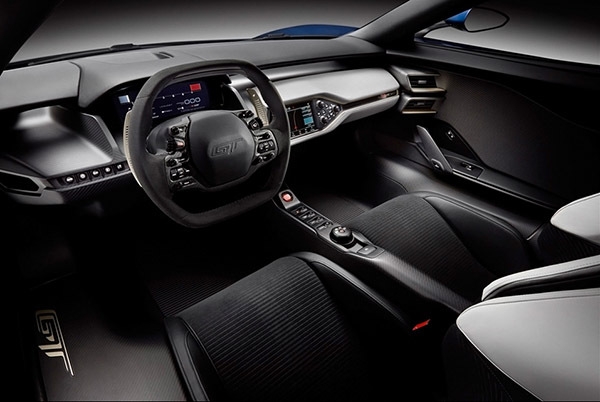 But Ford wants to use this car as a showcase of technology and efficiency so it’s making some choices that don’t necessarily fit today’s supercar zeitgeist. The first is focusing on performance not through the addition of sophisticated all-wheel drive systems or supplemental electric power units, but rather ultra-lightweight carbon construction. 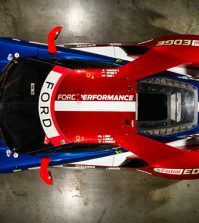 Weight is the enemy of sustained performance, and Ford is looking to sell more than a hero lap. 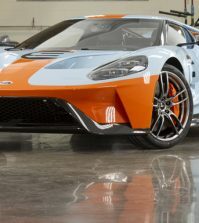 They won’t say what the GT weighs, only that this “Carbon Fiber Supercar” will have a superlative power-to-weight ratio. Not just a carbon fiber tub, the car also utilizes an entirely carbon fiber body. Also integral to the pursuit of power-to-weight ratio is the engine choice. Yeah, about that. It’s a 3.5L TT V6, essentially the same engine powering Ford’s IMSA Daytona Prototype entries, producing the aforementioned 600+ hp. I’ll give those of you that need a brown paper bag to prevent hyperventilation a moment to recover. 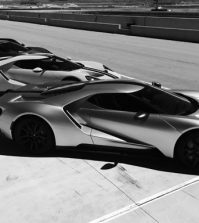 Yes, Ford is going to build a new GT, and when it does, it will be powered by two more turbos and two less cylinders than the last one. Clearly the EcoBoost family of engines has been integral to Ford’s success in recent years, and they want to put it to the ultimate test by powering their crown jewel with it. It is a risk, but in the context of the car’s mission as a technological bellweather, it makes sense. All that said, there’s another more important thing you think when you see the new GT. The car is stunning and insane and high tech in all the right ways. It’s a car that doesn’t just make cars like the 458 and 650S look plain; it’s makes even a car like the hypercar-segment Porsche 918 look conservative. I can’t wait to see it on the road and hopefully someday see out over the dash of one. But that’s not really where I want to see it, and it’s really not where it belongs. Cars like this are built to go very, very fast and they are built to do so at very special places with corners named things like Arnage and Tertre Rouge. 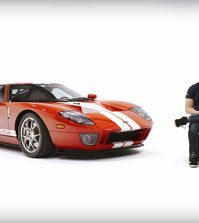 2016 will be 50 years since Ford’s supercar gave the company it’s greatest racing victory. Ford made no mention of this car ever going to such a place, but oh wouldn’t that be nice?